When a donor’s credit card has expired or we’ve processed their recurring contribution, we send out standard customer service email responses, which we allow you to customize. These blurbs add a personal touch and let your donors know how much you value their engagement with your movement. To add in custom text of your own, go to “Settings” in the menu on the left side of your Dashboard and scroll down to the “Blurbs, Disclaimers, and Tracking Codes” section of the page, where you’ll see three prompts for custom email text. If you don’t choose to write up blurbs for these sections, don’t worry! Donors will still receive a standardized message that provides the important customer service information (examples below).The “Decline email blurb” box allows you to add custom text to the email your donors receive if their contribution is declined. You can encourage your donors to reach out to their bank in the event that their card is declined or provide a way for them to follow up with you. Unfortunately, we weren't able to process your scheduled monthly contribution. In case this is a one-time error, we have not cancelled you remaining 18 contributions. We will attempt to process an identical contribution on the 19th of this coming month. If you've cancelled your credit card or if it has expired, please click the link below to provide us with a new credit card number. An invoice for the last successful scheduled contribution follows below. This charge was NOT made to your card. The “Expired email blurb” is the email text you want your donors to receive if their credit card has expired. Thanks to our integration with Account Updater, which automatically updates expired or lost credit cards, donors should not need to manually update their card information for recurring contributions most of the time. However, if a donor does need to manually update their payment info, you have the option to write a customized blurb. On July 25, 2014 you signed up to contribute $16.50 on the 25th day of each month through ActBlue. We have run 9 monthly contributions. For your reference, the details of your contribution are copied below. The credit card we have on file has now expired. Could you please take a moment to provide us with a new card number or a new expiration date for your current card? The “Recurring email blurb” is the text you’d like donors to see along with their recurring contribution receipt every month. This is a chance for you to let your donors know how much their continued support means to you. We just processed your monthly contribution. Thank you! You have signed up for this contribution to recur on a monthly basis. In addition to today's contribution, an identical contribution will be charged to your credit card on the 18th of each month. If you'd like to change the credit card we bill or the number of months you'd like to run this contribution, please click the link below. The email blurbs in the previous section are sent to donors in those specific situations, regardless of the contribution form they gave on. 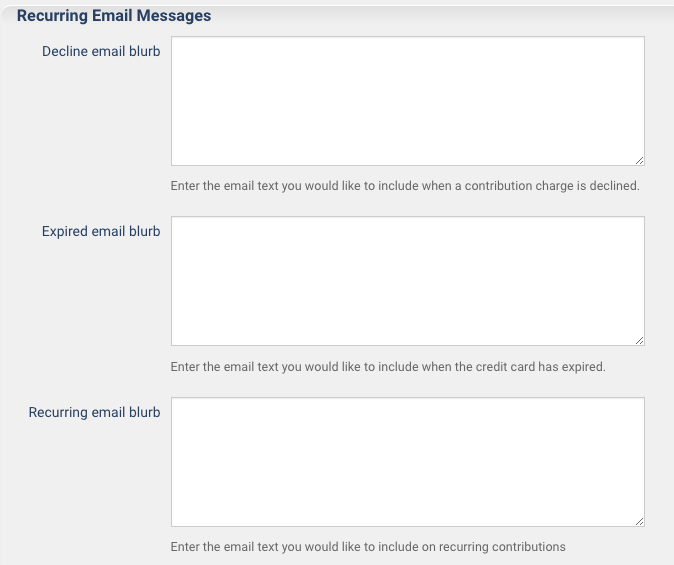 Here we'll show you how to customize additional messages that are specific to individual contribution forms. 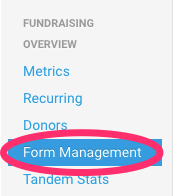 First, you’ll need to locate the contribution form you’d like to edit by clicking on “Form Management” on the left side of your Dashboard. On this page, you can find a specific form by using the search bar labeled “Filter by Name” and typing in your form’s name (URL slug). Once you’ve located your form, click on the Edit button to be taken directly to it. The form editor will be open on the left side of your screen. 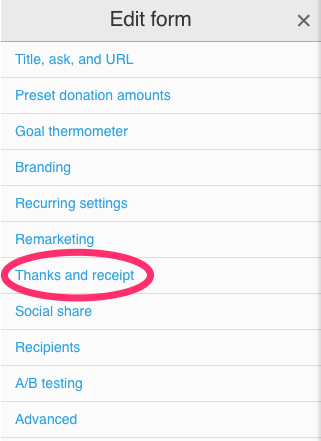 Select the “Thanks and receipt” tab to customize messages donors see after giving on this specific form. 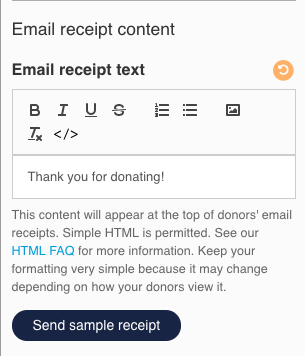 You can add a custom message for donors to see on their email receipt in the “Email receipt text” box. After users without ActBlue Express accounts donate on your contribution form, they'll have an opportunity to sign up for an ActBlue Express account. The “ActBlue Express blurb” is your chance to pitch ActBlue Express to them and get them to convert. Leave them a note letting them know how convenient contributing will be if they save their information and how much you value them taking the time to do so. You also have the option to customize the text your supporters will see on the Thanks page that appears after they give on your form. 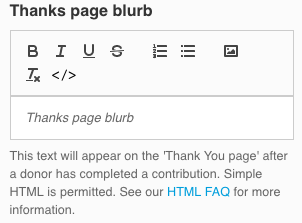 Just fill in your message in the "Thanks page blurb" box to let them know how much you appreciate their support. 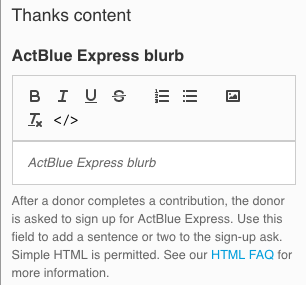 You can also enter a URL here that you want your donors to be sent to after they land on the Thanks page. 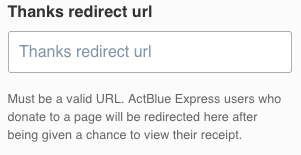 After contributing, your ActBlue Express users will see a popup that says, “Your contribution succeeded, thanks!” for five seconds before being directed to the page you’ve chosen. This gives you the opportunity to send your donors to an action page on your website, like a petition, or redirect them to a volunteer form and ask them to take the next step in supporting your cause. They’ll still receive their email receipt automatically upon contributing. Once you’ve finished making your changes, make sure to click the orange “Publish” button at the bottom of the form editor. This will ensure that all of your changes are saved!